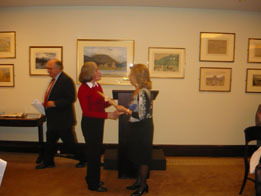 On 16 November, a reception was held at the Athenaeum on London’s Pall Mall to celebrate Ann Wroe’s Orpheus: the Song of Life and award her with the 2011 Criticos Prize. George Rodopoulos (President of the LHS) opened the proceedings, during which Dr. Carrie Vout (Chair of the Adjudicating Committee) spoke about the Prize and read an encomium by fellow Committee member Robin Lane Fox who was unavoidably absent. 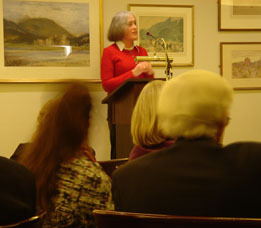 John Micklethwait (Editor of the Economist) introduced Ann Wroe who, in turn, gave a brief address on the subject of Orpheus. Within the audience which numbered almost 100, were H.E. the Greek Ambassador and many other dignitaries and friends of the Prize. An extended review of the evening has been written by John Faraclas and can be read here. Reviews of Ann Wroe’s Orpheus have appeared in the Guardian, The Daily Telegraph and The Literary Review.